Verdict: 3.75 / 5I am sceptical as to whether the quality of this series will dip in the future due to the elements I have mentioned but, for now, I’m going to enjoy the journey that thus far has been expertly crafted. Justice League #2 continues to work with this new setup of a multiverse on the brink of collapse. Snyder and co have been weaving this tale for a while now and it is interesting to see where it keeps going. Whilst Metal started this arc and No Justice continued it, moving it closer to what I assumed to be its conclusion, it seems now that the Justice League series is only going to up the stakes, adding evermore layers to the DC Universe. The breach in the multiverse in question appears to be altering the DNA of individuals such as Killer Croc. It seems that the best option the League has is to explore the breach and identify what is happening there. Of course, Martian Manhunter is uneasy about the whole situation, knowing with what risks they are dealing with. 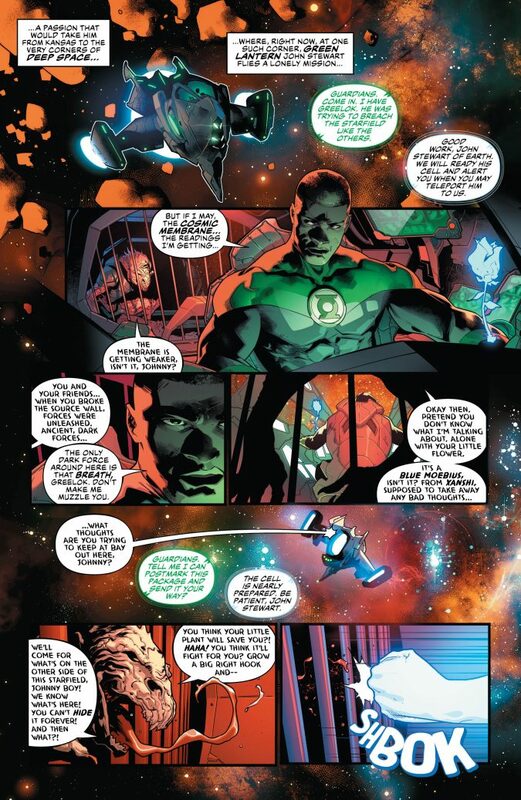 Elsewhere, Batman tries to recruit Green Lantern to the team, although John is not prepared to leave his intergalactic post. His run in with Sinestro is sure to have a larger impact in issue 3 and it’ll be interesting to learn more about the newly discovered invisible emotional spectrum. John as the leader of the Ultraviolet Corps is intriguing, although his villainous turn for me has really come out of nowhere. The breach in the multiverse in question appears to be altering the DNA of individuals such as Killer Croc. 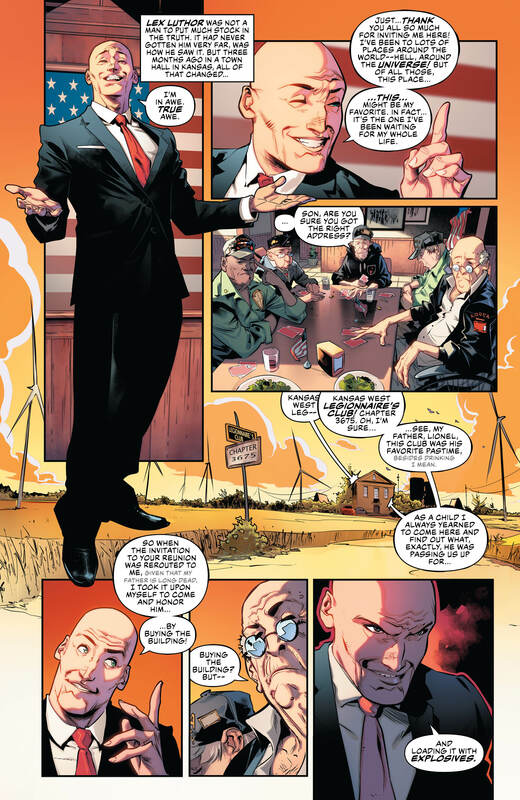 For Lex Luthor, he is continuing to discover his destiny, leading the Legion of Doom to whatever fate is bringing to them. His exploration of his past could have been given some more explanation and I don’t love the newly created and undefined MacGuffins that the Legion is searching for; especially the baby, which seemed like an odd inclusion. However, whatever the Legion has planned is clearly going to build up over a long time and I will enjoy discovering this narrative. The new mission the Justice League have set themselves upon, discovering the unknown regions of the multiverse, leaves a lot of creative options on the table for how this will play out. I have always enjoyed the concept of the multiverse and love that it’s been explored further, so I hope that some genuinely unique creative decisions are made and not more of the same much like the MacGuffin issue. No one, in particular, stood out in this issue to me, as everyone, for the most part, had a role to play. Perhaps Barry was the weakest, doing more whining than anything else, although he is sure to be featured me upon the Ultraviolet Corp’s attack. I’d love to know what other Corps there are, although I can’t imagine it’ll completely follow the electromagnetic spectrum; a microwave corps would seem especially odd. The story in Justice League #2 clicked for me, although some recycled narratives dragged it down a bit. The artwork was as always stellar and I want to keep reading to see where this goes. Maybe that is a sign of a good book, but it is the Ultraviolet element that’s interested me the most.